On the morning of April 5, 2019, Harry (Jr.) Gregory, age 65, our beloved husband, father, grandfather, great grandfather, brother and friend passed into the arms of God. He was a lifelong resident of Newport News, graduating from Warwick High School. Jr. served in the Army and retired from Howmet after 39 years of service. 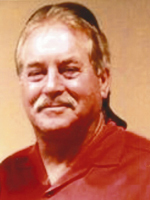 Jr. was a devoted family man, enjoyed yard work, collecting Tommy Bahama shirts and spending days at the ball field watching his grandchildren play ball. He is preceded in death by his parents Mary and Harry Gregory; sister Janet and brother Calvin. Left to cherish his memory is his wife, Karen, of 44 years; his two daughters Courtney Jones (Brent) and Misty Etheridge (Raymond); His grandchildren Kaitlyn (Shareef), Paityn, Brooklyn, Raymond (a.k.a. Bubby) and Parker; great grandson Bentley; best friend and brother-in-law Jim Conley; sisters Geneva and Shirley and many more extended family and friends. The family will receive friends from 6-7:30pm, Tuesday, April 9, 2019 at The Weymouth Funeral Home. Funeral services will be conducted at 12:00 Noon, Wednesday, April 10, 2019 at The Weymouth Funeral Home Chapel with Interment in Peninsula Memorial Park. In lieu of flowers, please make a donation to Patient Advocate Foundation. Jr. had a kind heart and soul and will be deeply missed by all. Rest in peace my dear husband. I will miss you forever!